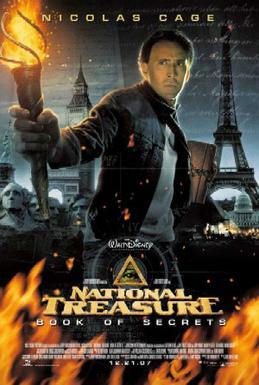 This is the sequel to “National Treasure”. It's on the same level as the first movie, which means more light Indiana Jones-type entertainment with a slight whiff of conspiracy theory and alt-history. The fictitious book “The Templar Treasure” in the film may be based on the very real “The Templar Revelation” by Lynn Picknett and Clive Prince. Or it might not, since hundreds of such books exist, speculating about the role Masons and other secret societies played in American (and pre-American) history. One problem with “National Treasure: Book of Secrets” is that the plot is too obvious – I figured it out after something like five minutes! The rest of the film is pretty much business as usual, with the good guys being chased by the bad guys (and perhaps the Feds), but there are a few unexpected twists, as well. I was somewhat surprised by the reconciliation between Union and Confederacy at the very end. I was also surprised that the gold prices didn't plummet! Nicolas Cage and Ed Harris are unmistakable, but I didn't recognize Helen Mirren due to all the make up. According to rumor, Jon Voight supports Trump these days. Still, thanx for the entertainment!